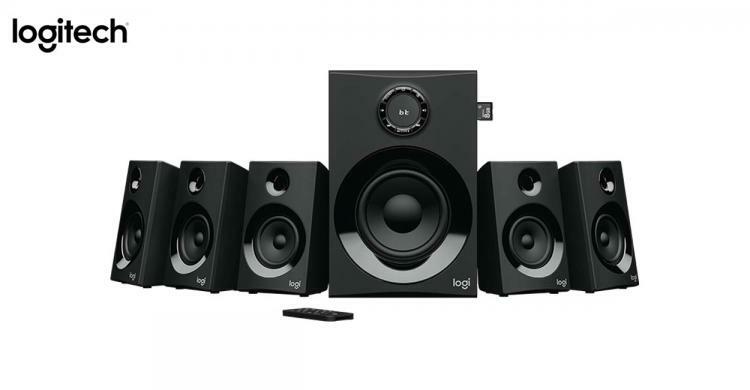 Logitech presents the Z607 5.1 Surround Speakers with Bluetooth connectivity offering wireless connectivity with various devices and audio sources at an affordable price point of £109.99. The Logitech Z607 features a multi-source connectivity allowing you to connect it to your PC, notebook, smartphone, TV, FM Radio and others via 3.5mm plug, RCA cables or Bluetooth. The Logitech Z607 also comes with a built-in media player wherein you can listen to audio from an SD card or USB flash drive. The Logitech Z607 comes with a 6-metre cable for its rear speakers allowing more freedom to position speakers to create a surround sound system. The Logitech Z607 5.1 Surround Sound Speaker packs a 5.25-inch subwoofer driver with a peak wattage of 160W to deliver powerful audio with deep and powerful bass along with clear highs. It comes bundled with a compact remote control with a 10-metre radius reach so you can remotely pause, play, skip tracks, adjust volume and more. Its rear satellite speakers have extra-long 6.2m cables so you can free position them in a large area to create a 5.1 surround sound environment. You can mount them on walls, place them behind desks or consoles. The Logitech Z607 is perfect for gaming systems, home entertainment or simply your preferred partner for your favourite audio player. The Logitech Z607 features Bluetooth 4.2 connectivity with an effective wireless connection of up to 15 metres within line-of-sight. The Bluetooth 4.2 connectivity also offer reliable and lag-free streaming, up to 2.5 times better than Bluetooth 4.1 connectivity. Logitech covers the Z607 speakers with a limited 2-year hardware warranty. The Logitech Z607 5.1 Surround Sound Speaker with Bluetooth is now available for pre-order at Logitech UK for £109.99. Learn more about the Logitech Z607 here.